Traffic lights are few, and bike paths and walking trails are many on Dauphin Island. 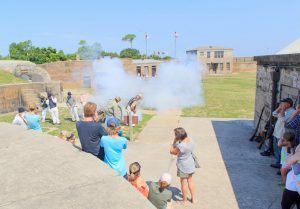 Home to Historic Fort Gaines, the Estuarium at Dauphin Island Sea Lab, and the Mobile Bay Ferry, this oasis provides family-friendly fun away from the hustle and bustle of city life. Dauphin Island beckons you to slow down and spend time reconnecting with nature. The opportunities below will help you do just that. Climb through tunnels. Observe original cannons, kitchens and a blacksmith shop. Shop the museum gift store. Historic Fort Gaines is one of the key sites of the Battle of Mobile Bay, during which Admiral Farragut gave his famous order: “Damn the torpedoes – full speed ahead!” Standing guard over the entrance of Mobile Bay for more than 150 years, Fort Gaines was recently designated as one of the Eleven Most Endangered Historic Sites in America because of its shoreline erosion. The estuarium highlights four key coastal Alabama habitats: The Mobile-Tensaw River Delta, Mobile Bay, the barrier islands and the northern Gulf of Mexico. While the Sea Lab’s main focus is on educating the public about marine science, research and conservation efforts, it also provides hands-on edutainment. Kids love the 31 aquariums, the stingray touch pool, and the Living Marsh Boardwalk. 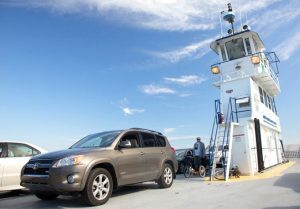 The ferry saves drive time by shuttling passengers back and forth from Fort Morgan to Dauphin Island. This ride puts the FUN in functional! Considered “the Gulf Coast’s Most Scenic Drive,” the ferry gives patrons a prime view of marine life, birds and other sea vessels. The voyage takes approximately 40 minutes, and you will enjoy every minute of it. Be sure to check the ferry schedule before heading that way. These are just three of the exciting attractions Dauphin Island has to offer. The island also is a great place for birding, hiking and relaxing on the seven miles of public beach. This coastal community is definitely worth the stop!